I ate jelly doughnuts in my friend’s home. Wow, how delicious! So I asked her the recipe. 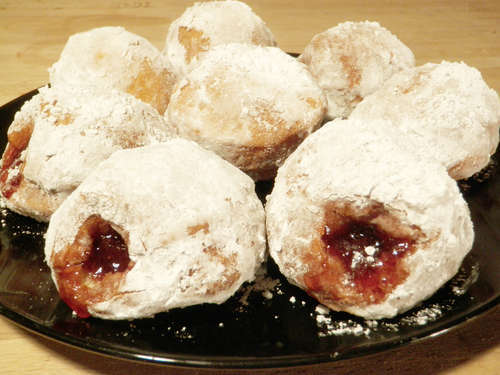 How jelly doughnuts cuisine are made? Let a cup of milk cool to room temperature. Melt 2 tablespoons of unsalted butter and let it cool. Combine 4 cups of flour and 1 teaspoon of salt until good and mixed. Stir together 2 tablespoons of your lukewarm milk and 2 tablespoons of sugar. Pour in your dry active yeast and let sit for approximately 10 minute until it starts to bubble and foam. Mix in your activated yeast, followed by the remainder of the milk, followed by two well-beaten eggs and finally the melted butter. If using a standing mixer, replace the mixer attachment with the dough hook. If you have a standing mixer this is really easy. First make sure you have the dough hook attached and then turn the mixer on to low. Simply add the remaining half cup of flour by small additions, while alternating with small additions of milk until the dough is smooth and pliable. If you are not using a standing mixer, you will have to knead it by hand. Repeat the same process with the flour and the milk until the dough is smooth and pliable. Place the dough in a lightly oiled pan and let is site for around two hours until the dough has doubled in size. Here is your opportunity to wash the dishes you have used thus far, clean the counter and prep for the remainder of the process. None of this should take two hours. Use the remainder of the time to play Metroid. Assuming that you are out of practice at Metroid, I have included a cheat code below to help you along. Once the dough has risen, lightly flour a clean work surface and your rolling pin. Flatten the dough in the bowl and then roll it onto the floured surface. Using your rolling pin, spread the dough out until it is around a 1/2″ thick. With a cookie cutter, cut out 3″ rounds from the flattened dough and place them onto a lightly floured cookie sheet. Keep re-balling and rolling out the dough until you can’t cut out any more doughnuts. When you are done, place them somewhere warm for roughly 20 minutes and allow them to double in size. While you are waiting for the doughnuts to rise, now is a good time to do some prep work since the next few steps all happen very quickly and in some cases simultaneously. It is important to make all of the following preparations first. I turned the kitchen into a disaster zone trying to do all of this at once, but I imagine it will be slightly easier if you also aren’t trying to take pictures at the same time. First things first, fill a large and tall pot with 2″ – 3″ of oil. Attach a candy thermometer to the pot and put it on a medium flame so that it can slowly start building up to 350 degrees. The goal is to keep the oil at 350 degrees. That is 350 degrees Fahrenheit. Keep the oil at 350 degrees. Next, you are going to want to spoon your jelly into a pastry bag with a 1/2′ metal tip. The metal tip is important for effectively stabbing into the cooked doughnut. Lastly, fill a bowl with a generous amount of powdered sugar. This will be used to coat the scorching hot newly fried doughnuts. Once the oil hits 350 degrees, carefully use your spoon to place them into the oil. Flip them often. Continue cooking until the look golden, doughnut-like and delicious. Carefully remove them from the oil using metal tongues. Being careful not to touch them (heated oil is hot), use a metal spoon to roll them around and coat them in powdered sugar (don’t do as I did in the pictures. I got some nasty burns). Stab the side of a doughnut with your pastry bag and squeeze in jelly until you start to feel resistance as though the pastry bag is being pushed back out of the doughnut. This is indication that your doughnut is ready to eat. Repeat until all the doughnuts are ready to eat.